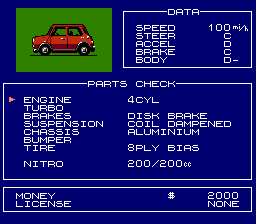 Continuing with the high-speed theme from last night’s post, I made a push tonight to get more old NES racing games into MobyGames. 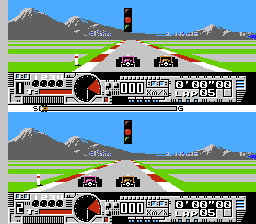 I came to realize I was quite spoiled with the types of racing games I played on the NES and SNES. 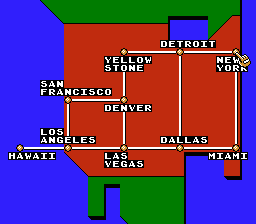 Games like The Adventures of Bayou Billy, The Mafat Conspiracy, Rad Racer II, RoadBlasters and F-Zero come to mind. These were pretty much “on-rails” where not much could go wrong. These games often involved munitions of some sort, too. So it was somewhat a shock to discover that the NES was capable of hosting more considerate and faithful racing games. In particular, I played 3 separate formula one racing games. Fortunately, when you screw up, the nice lady in the race official’s office advises you about what part of your car to upgrade to do better next time. For example, upgrade the chassis if bumping into another car causes you to spin out of control. 2 celebrity-licensed games I played were Michael Andretti’s World GP and Nigel Mansell’s World Championship Challenge. They each have 16 international courses for F-1 racing. However, Andretti’s title was easily the most intense racing experience I had yet seen on the NES. First, there was head-to-head, 2-player, split-screen racing which impressed me greatly. The racing action requires you to worry about shifting and if you corner too hard, you can easily spin out. This is a racer that takes some serious practice. Another racing game (I assumed it was such due the the word ‘race’ in its title) I played today was Death Race. After playing, and by sheer coincidence, I happened upon this review which alerted me to the fact that Death Race 2000 was a Sly Stallone movie made in 1975. This is the bad game of today’s bunch, hardly surprising considering it was an adaptation of a B-movie made 15 years prior and was further an unlicensed NES game published by an extraordinarily generic-sounding company named American Game Cartridges (proving that the only thing worse than licensed schlock is unlicensed schlock). Even stranger is that there was actually an arcade game based on the movie that made its way to video arcades in 1976. It was perhaps the first truly controversial video game if Wikipedia is to be believed on the matter. 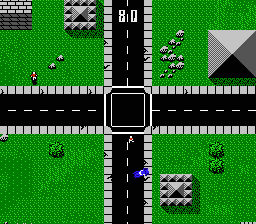 The thrust of the game is to soup up your car to run down pedestrians and win races by capturing flags and finding exit doors. One final observation: Isn’t it oddly convenient that cars in 8-bit racers can never go faster than 255 distance units/hour?